Attic Breeze offers the ideal ventilation solution for any application. These amazing attic fans are manufactured using only the highest quality parts and materials, Attic Breeze products are designed to consistently deliver the quality performance you expect. There are several different versions of fans available; our proprietary UltraFlō™ design technology produces up to 1550 CFM of airflow for The Zephyr™ series residential products, keeping your home cool and reducing energy consumption. The Grande™ series, our commercial line of solar powered ventilation products, delivers a powerful 1800 CFM of airflow, the best performance of any solar powered ventilation product in the industry! Available in a variety of color choices, roof flashings, and solar panel mounting options, Attic Breeze has an environmentally friendly solution for all of your ventilation needs. 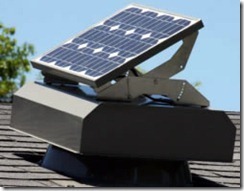 Why do you need a Solar Attic Fan? Radiant heat and moisture build up are an attic’s worst enemy, working together to cause a variety of problems for your home. In many cases passive ventilation is simply inadequate in controlling these elements, resulting in high electricity bills and accelerated deterioration of building materials over time. The answer to this problem is proper ventilation. By increasing airflow through the attic, more heat is actively removed thus lowering the attic temperature. Minimizing attic temperatures will increase the overall efficiency of your attic insulation and reduce the amount of heat transferred into your home. The result is a more comfortable home which requires less energy to cool. 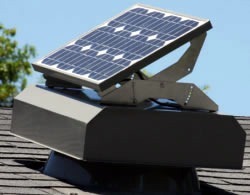 Attic Breeze solar attic fans provide a cost effective solution to this problem by continuously removing heat and moisture build up throughout the day. Increasing air changes through the attic, our solar attic fans will reduce attic temperatures within 5-15°F of ambient temperature, minimizing heat transfer into your home. Best of all, Attic Breeze products operate at absolutely no cost, economically cooling your attic using only the power of the sun.